Hiroshima December 12, 2014 · 10 min. readThis article may contain affiliate links. 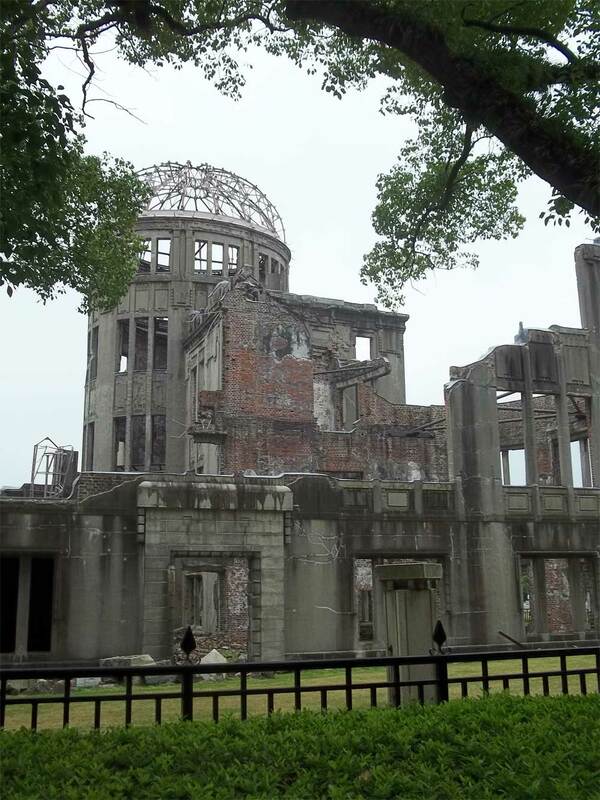 After a quick, non-complimentary breakfast, we boarded the train from our hotel and rode it for about 20 minutes, arriving at the A-Bomb (as in Atomic Bomb) Dome. It was so incredible to see. Back in 1945, the building was a landmark of the city. It was a famous dance hall, where performances and shows would often take place. Now it's a landmark for a completely different reason. Now there are no cries of joys or folk music coming from the structure. There is nothing but a haunting quiet that hangs around the burnt, dilapidated stone structure. The structure demanded silence; as if speaking too loud would cause it to finally collapse. The bomb, Little Boy, was to hit only meters away at the T-Shape Bridge. However the Enola Gay missed their target and instead dropped the bomb several hundred meters way on a hospital. Had it landed on the bridge, this structure would have been completely vaporized. Just to stand in the shadow of this structure was an incredible feeling. 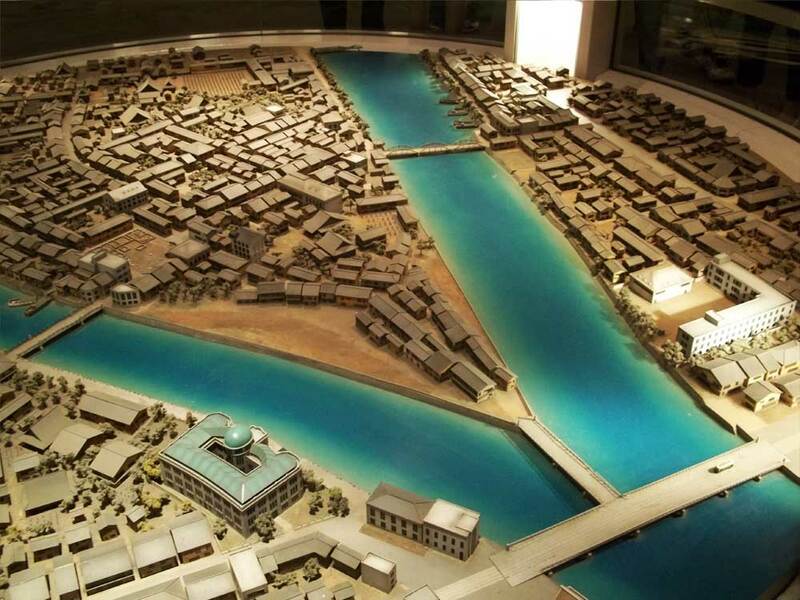 The city of Hiroshima was so alive, but the A-Bomb dome is nothing but death -- a cruel, harsh, never ending death. It's a solid testament to the power of nuclear weapons, and the darkness within the human heart. We walked around the dome and then headed to nearby hospital, the once "Hypocenter" of the blast. 75 years ago, when the bomb fell, this building was completly flattened. Steel melts at ~1,300 degrees Celsius, while at this location the fireball was between 3,000 and 4,000 degrees. The building, everything and everybody inside was instantly killed. We then backtracked and went to the museum across the river. Before starting the tour, we watched a short English video about the city and country's reaction to the explosion. After the initial blast, the main concern was treating the injured people. However, many of the doctor's within the city were also injured. It focused on two groups of people in particular: one was a woman who had glass thrown into her eyes during the blast. She was left with a grotesque scar from her inner eye socket, down her jaw and behind her ear. The other group was a brother and sister. Their hair had been completely burned off during the blast. When it grew back months later, it was a thin, sick, pale white instead of the thick, black hair Japanese denizens normally have. 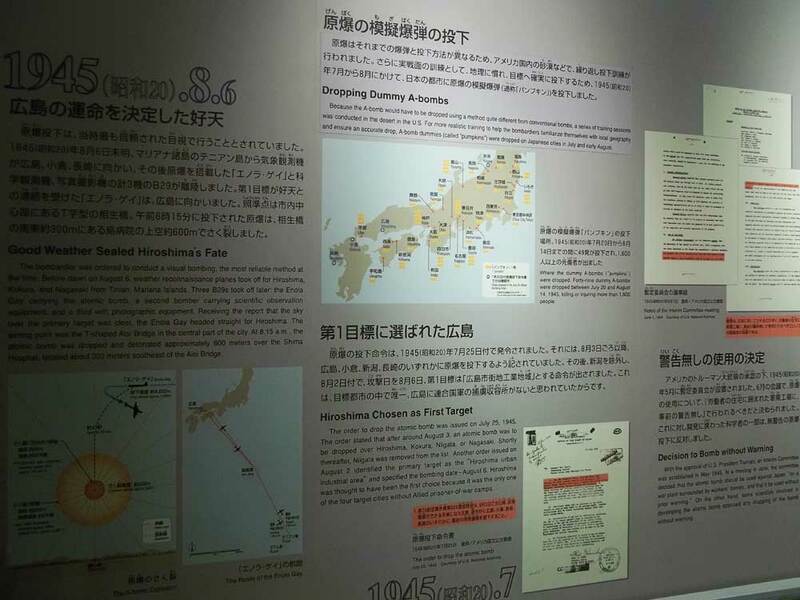 Patients soon began to get very sick, and when the military finally arrived to see what had happened, the declared the illness to be "a-bomb disease". We now call it radiation poisoning. A decade later, the war was over and the city was in the process of rebuilding. The children that had survived the blast and the injuries were beginning to get sick. The first case was that of a young boy. When he arrived at the hospital, he was very weak, his red blood cells were very low and his white blood cells were very high. The doctor treating him had never seen this before and was unsure how to treat the boy. Three days later, the boy was dead. This illness now has a name; leukemia, or cancer of the blood. This is the same time period and the same illness that killed Sadako, the young girl who folded 1,000 paper cranes in hopes of one day getting healthy. Another decade passed, and we are now entering the 1960s. Survivor's of the blast are now having children, but something seems wrong with one of the children. She's a young woman, around 20 years old, but has the brain of young child. The video was made long ago and claims the woman was "retarded", but I believe she had Downs Syndrome. The radiation had even affected children that had yet to be conceived. 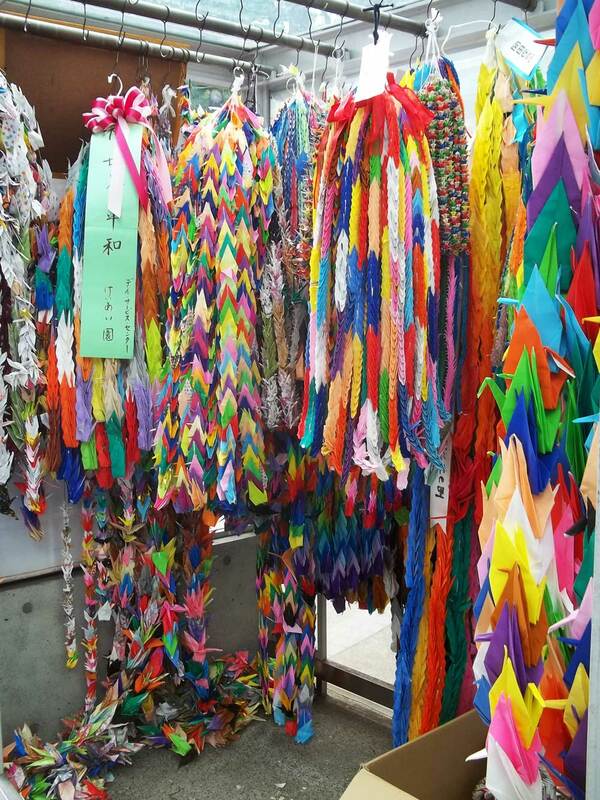 Thirty years now, and Hiroshima has become a city strongly against war. Never again do they wish for such atrocities to fall upon another city. The people of this city feel responsible for the war, and in turn feel responsible for any other person that is affected by atomic power. These people blame themselves, not the United States of America, for pushing the war to the extent where atomic weapons were the only option. This thought is very humbling. The first part is the history of Hiroshima -- how it came to be, how the war changed the city, why it was chosen as a target, the fake "pumpkin" bombs the USA dropped in preparation for the atomic warhead, the false "all clear" siren the city gave, and the dropping of the bomb at 8:15 AM on August 6th, 1945. 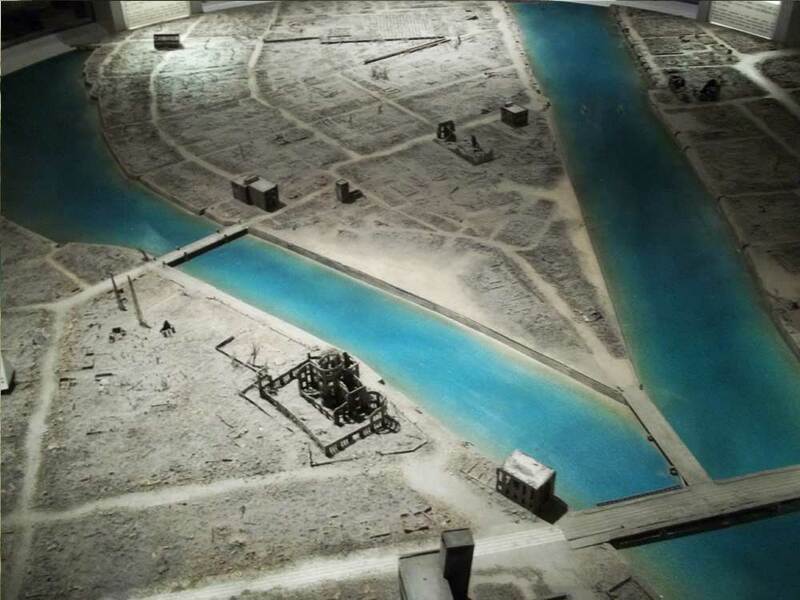 The second part of the museum was what the bomb did to the city. This section of the museum was very graphic, and showed images of the victims, as well as which countries currently or potentially have nuclear weapons. This section also showed wax figurines in positions during the initial reaction to the blast. One display stood out for me, but my picture didn't turn out. The best way to describe it is with two words: melting fingers. Although the first two parts are the most "interesting" parts of the museum, the last part is the part the museum really wants people to take away from it. It explores the future of our world, and nuclear prevention in the future through programs like "Mayors for Peace". It also discusses the terrible, and very real, possibility of nuclear war in modern times. After the museum, we met together as a group, collected our emotions and went down to the statue of Children's Statue not far from the museum. 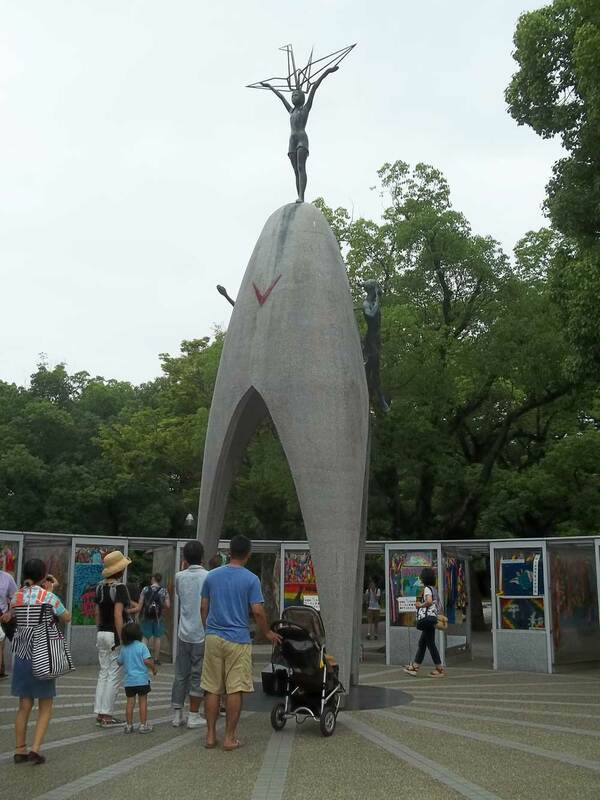 This statue was dedicated to all children that suffered from both the atomic bomb, and any wars throughout history, and was inspired by Sadako's bravery while she died fighting cancer. The previous night we had made paper cranes, and it was here that we delivered them to join the massive collection of hundreds of thousands of paper cranes. From here, we headed back to the train station after a quick shot of the A-Bomb Dome as we crossed T-Shaped bridge (which, by the way, survived the bomb, but didn't survive the test of time and had to be rebuilt). We went to a resturant near our hotel, and had another history lesson. 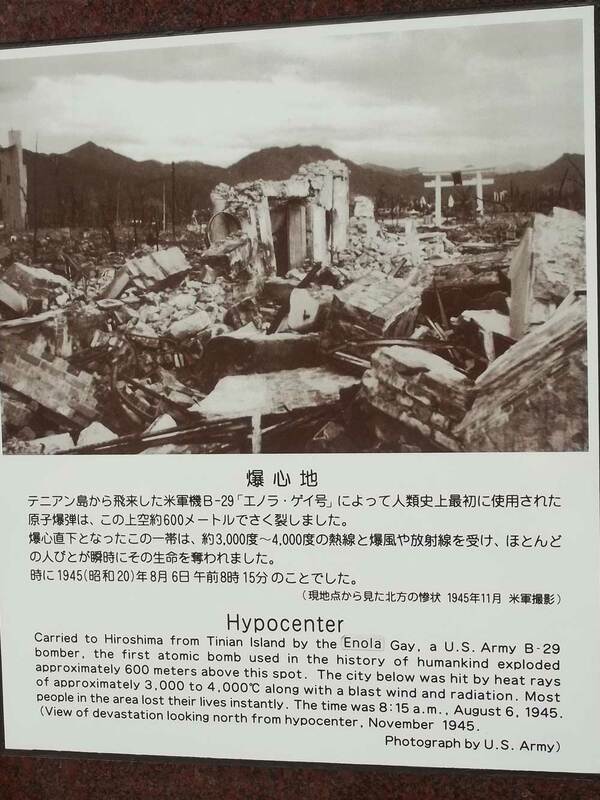 After the war, the United States sent aid to Hiroshima and Nagasaki to help with the recovery. When they arrived they discovered the crops were damanged and food would be difficult to come by. So the Americans made a simple form of pancake, which can be cooked with cabbage and meat, sauce and seeds, and be a very filling meal. That dish is still sold today, and we got to try it. We had a new desination, a much happier one: Miyajima. Editor's Note: If you wish to sign a petition to help make the future nuclear free, please check out The Atom Project. Thank you.